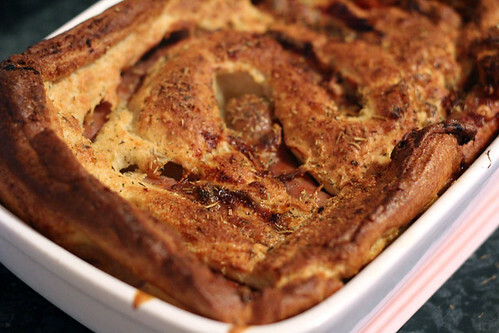 Toad in the Hole | Abandon Spoon! 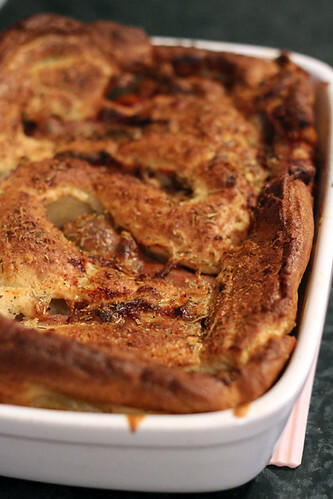 I’ve not made this for a really long time and after recently having Yorkshire puddings with my Nana, it gave me a real craving for more lovely batter! There are lots of slightly different ways to make the batter, for me the key is to get as much air in it as possible, so get those wrists strengthened! Some people like to use lemonade or beer to create more air, some people (my Nana) like to stand outside and beat it to get as much air in as possible. I used Soda Water for this recipe, so as not to get any taste as you would from beer or lemonade. I don’t measure how much flour/milk/soda water I put in, I just go with how it feels, when you are beating it it doesn’t want to be too stiff. I made this for my housemates and it got demolished very quickly. I was pleased with how it turned out as our oven can be a little temperamental, so it’s often hard with the timings. Just keep an eye on it, if it’s starting to brown on top but still raw in the middle, turn down the heat on the oven. 1. Pre-heat the oven to 180C. 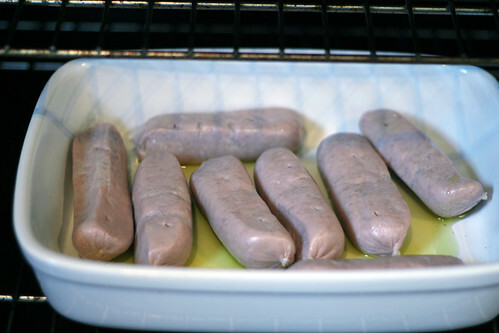 Once it’s up to temperature place the sausages in a overproof dish with some olive oil in the oven. 2. 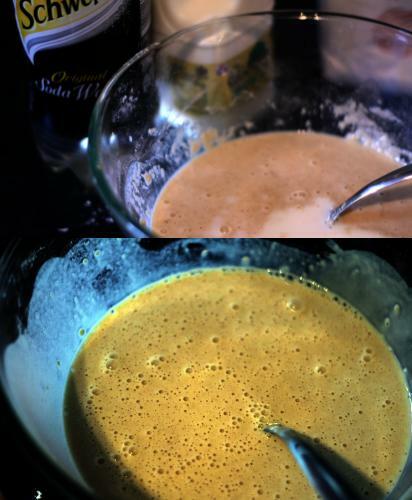 While they are cooking, mix up the batter. Mix together the salt and flour together. 3. 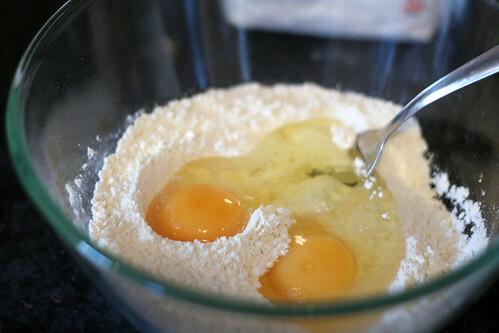 Crack the eggs into a well in the flour and mix. 4. Add in some milk and soda water and beat, continually adding more liquid until runny. 5. Beat the mixture until you have lots of little bubbles. 6. Take out the sausages after about 10-15mins and pour the batter mix over them, so that they are about 3/4 covered. 7. Sprinkle with herbs; I use Rosemary and Thyme, and season with a little salt and pepper. 8. Cook for approx 30mins. 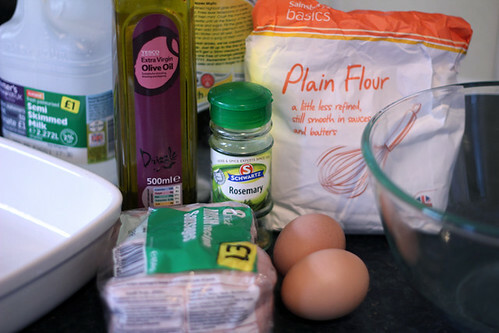 To check if the batter is cooked put a knife into the mix and if it comes out clean its cooked. 9. Once cooked serve with onion gravy and enjoy. that bag of sain’s basics reminds me of the muesli I used to buy all the time – brings back memories. great looking recipe!